When you get down to it, this 2-CD collection of studio and live rarities is really for the fan who has or nearly has every thing recorded by the veteran rockers. Admittedly the songs here on this set doesn’t drastically depart from anything stylistically we’d expect from Angus Young and company, which is essentially bone-crunching hard rock. 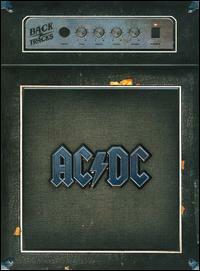 More than half of the studio rarities on Disc 1 is devoted to the Bon Scott era with a mix of swaggering rock (“R.I.P.”); a ballad (“Love Song”); and a slow blues number (“Crabsody in Blue”); the rest is blistering hard rock from Scott’s successor with the menacing vocals Brian Johnston (“Down on the Borderline,” “Love Gun”). The live rarities portion consists of staples such as “Back in Black” (recorded live in ’81), “You Shook Me All Night Long,” “Highway To Hell” and “Dirty Deeds Done Dirt Cheap” from ’77 featuring Scott. The DVD disc consists of (cheeky) promo videos from 1993 to 2008 (“Hard As a Rock,” “Safe in New York City,” “Rock and Roll Train”) as well as some bonus clips such as “Jailbreak” and “You Shook Me…”). All in all, Backtracks puts everything out there for AC/DC completists.